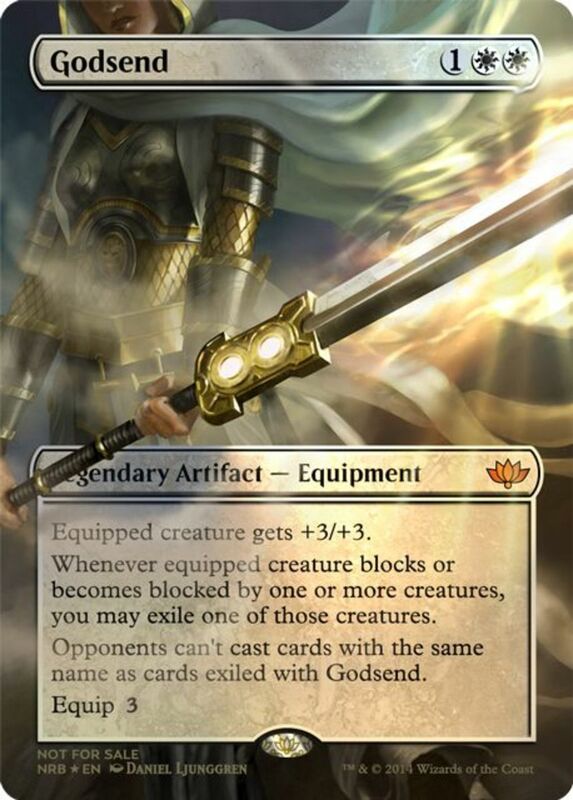 When you can get some of the strongest Magic creatures out, like high-cost angels, dragons, or eldrazi, you're well on your way to victory thanks to their fierce battle stats and unique effects. Of course, the stronger the monster, the more mana you'll have to invest, meaning the best creatures are often unavailable throughout the game thanks to their steep price. Luckily, various cards let you play creatures without paying their mana costs, fielding your lethal champions for a fraction of their actual value. To be clear, we're looking alternative methods to mana ramping (where you simply rapidly collect resources), which we'll save for another countdown. So, how can you best gimmick your titans to the field? These are the ten best free-creature spells in Magic: The Gathering! This infamous blue and red card offers a great way to play spells of any type, and her legendary status makes her a formidable commander in EDH format. Her 2/2 (two power and two toughness) stats aren't great for a three-cost creature, but Jhoira lets you spend two mana of any color to suspend a card from your hand with four time counters, letting you cast it for free in four turns! Although you'll have to stall until they arrive, you'll have hefty reinforcements on the way, and you can hasten the arrival using supports like "Jhoira's Timebug". As icing on the cake, you're free to use the trait multiple times in a single round, and you can even activate it on your opponent's turn, letting you see what plays they make before deciding what you'd like to suspend. All three are sweet abilities that adeptly follow the same theme: supporting creatures. The hand-strengthening of +1 is nice and the awesome powers of -7 are great if you can afford them, but we're most interested in -3. 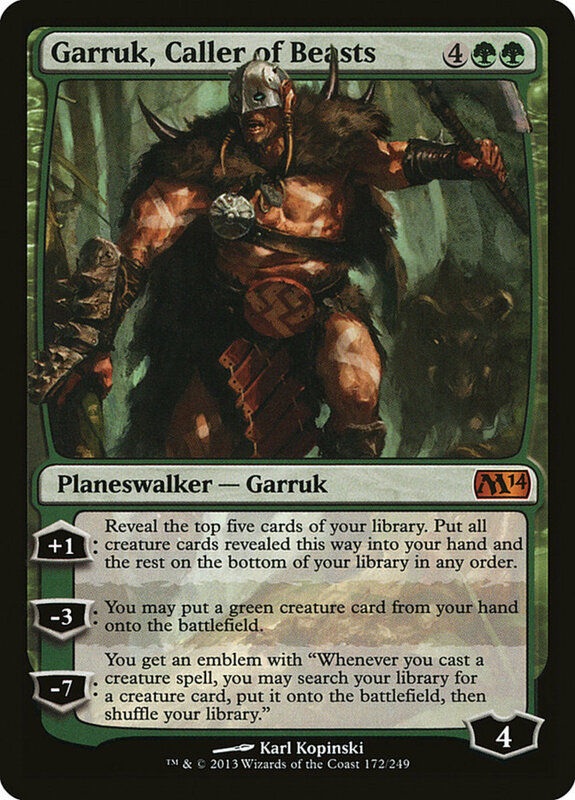 This lets you immediately summon a green monster, and since Garruk arrives with four loyalty counters, you can immediately use the trait without killing him. An awesome effect, but note that playing a creature for free doesn't count as casting it, so cast-only abilities won't trigger. Sneak Attack belongs to the red faction and offers speedy and cheap creatures—for a price. After an initial investment of four mana, you'll also need to pay an additional red mana whenever you want to activate Attack's effect, but at least you can use it multiple times in a single turn. Resolving the ability places a creature from your hand for free and gives it haste, letting it attack or tap the turn it arrives. Yep, all of a sudden, you have ready-to-move eldrazi or dragons to ravage your foes; however, you'll have to sacrifice the unit at the end of your turn. Still, even a single turn is enough to make good use of the eldrazi's game-changing annihilator trait and seize the advantage in any duel. Norwood Priestess is a risk since she arrives with puny 1/1 stats, pitifully weak for a four-cost creature; a single -1/-1 counter or Lightning Bolt instant can defeat her. However, Priestess may tap during your turn (before any attackers are declared) to play a green creature from your hand onto the field for free! It's as simple as that. Assuming Priestess survives, you can continuously field creatures without paying their costs, saving your mana for other spells. Strive to get haste on Priestess to let her tap immediately and hexproof or shroud to prevent her being targeted. 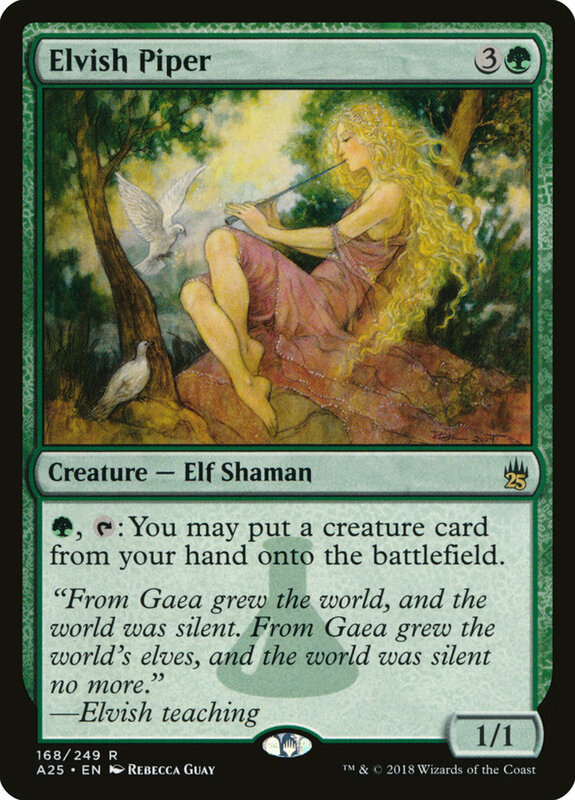 Elvish Piper functions very similarly to Priestess. Both are four cost creatures with 1/1 stats, but Piper only needs one green mana, making her a bit more compatible in multicolor decks. When Piper taps to field a creature, you'll also have to spend a green mana. However, you can use this on either player's turn, and you're now free to summon creatures of any color! This lets you play your most powerful non-green units (particularly handy with colorless eldrazi) for a ridiculously low cost of one mana. While Piper and Priestess are both weak on their own, they harness unrivaled repeated creature fielding and carry the useful elf subtype, strengthening the effects of several elf-dependent cards. 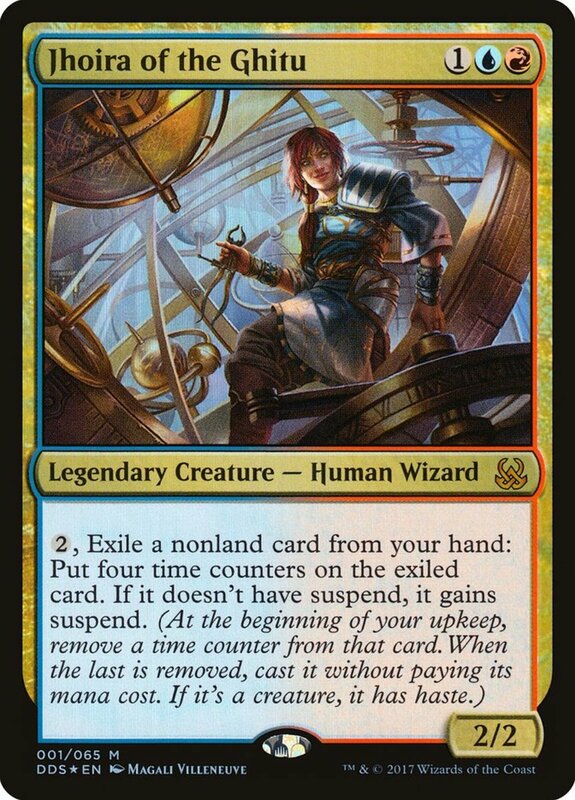 One of the best commanders in EDH format, Kaalia needs four mana with at least one stemming from red, white, and black. She's rather weak at 2/2, but posses flying, letting her soar over ground-based blockers. 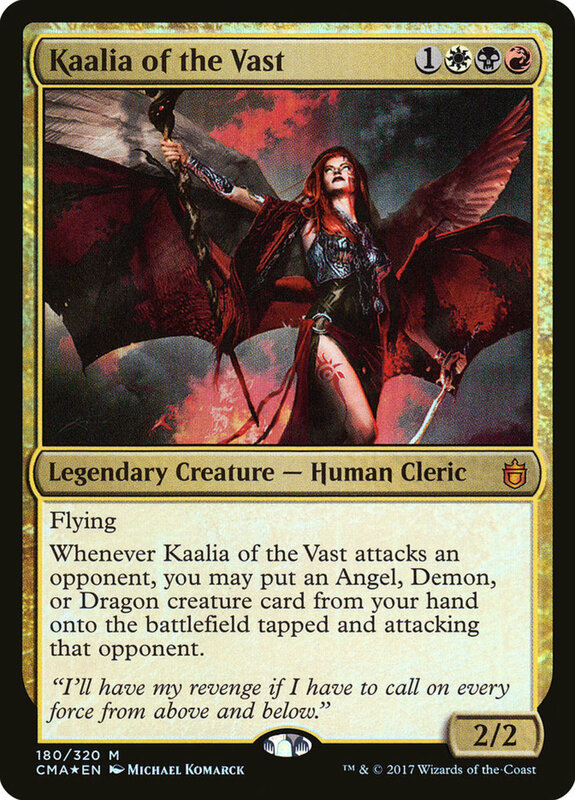 Better yet, when Kaalia attacks, you can play a dragon, demon, or angel from your hand tapped and attacking for free! 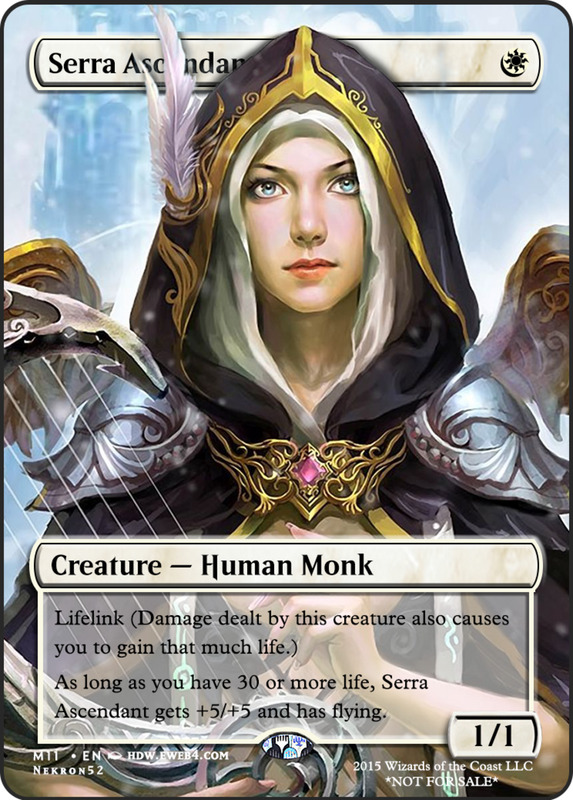 These three creature types offer some of the strongest cards in the game and make excellent use of this cleric's ability. 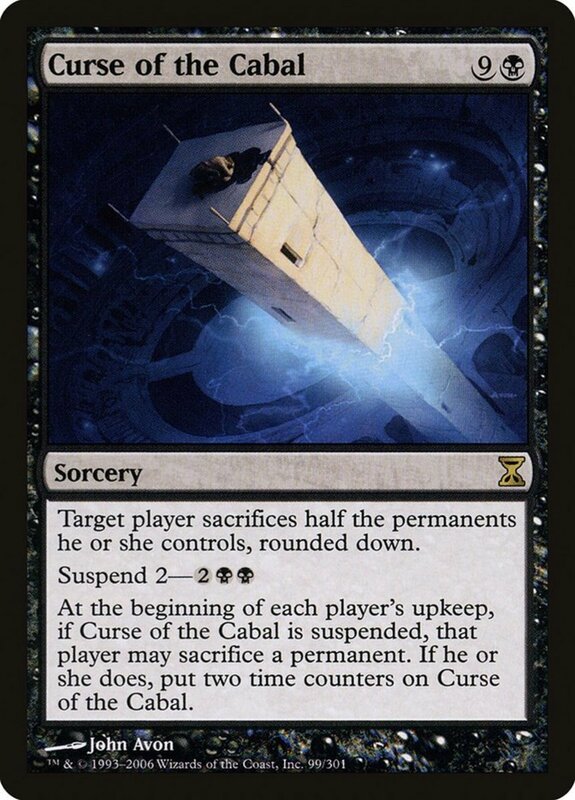 To best use Kaalia, play spells like "Dolmen's Gate" to protect your attacking creatures (so she doesn't die) and "Lightning Greaves" to give her haste. 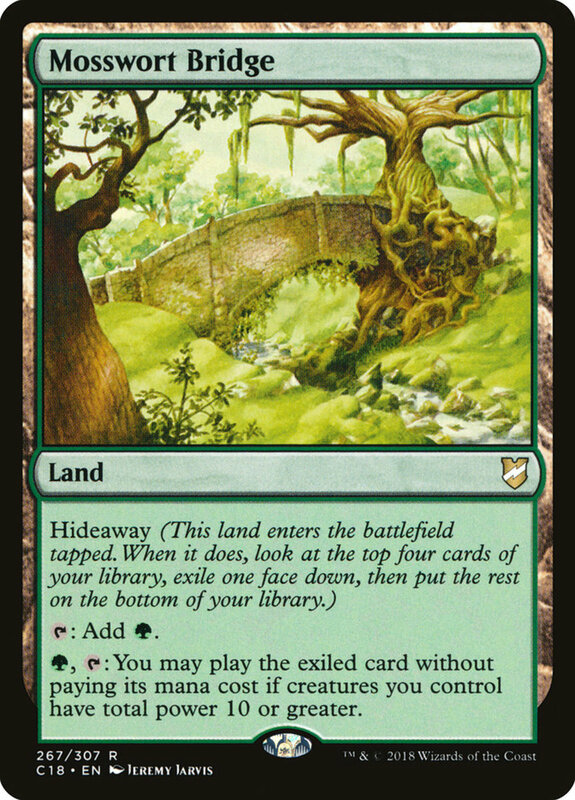 Like most lands, Mosswort Bridge doesn't cost any mana to play, but its downside is entering the field tapped, so you'll have to wait for later turns to make use of its abilities. 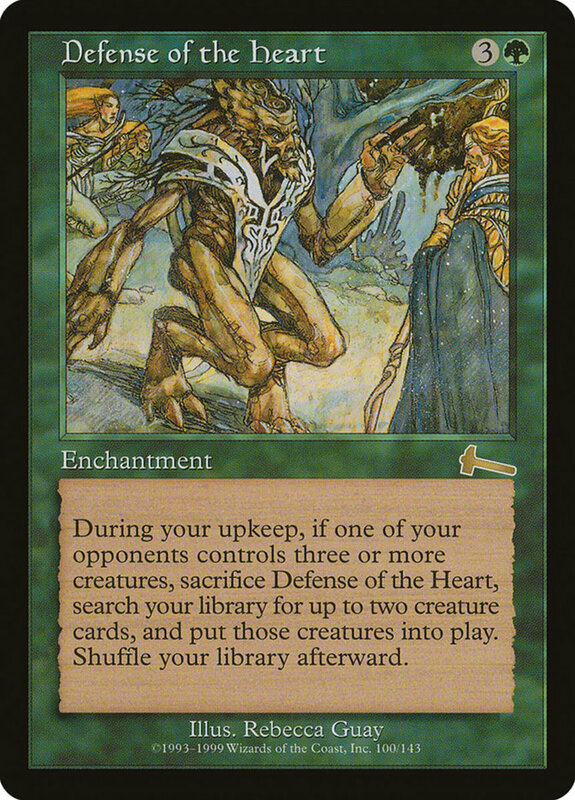 However, it can tap like a regular basic forest to provide one green mana, and when first played, you look at the top four cards of your deck, exile one face-down, and place the rest on the bottom of your deck. 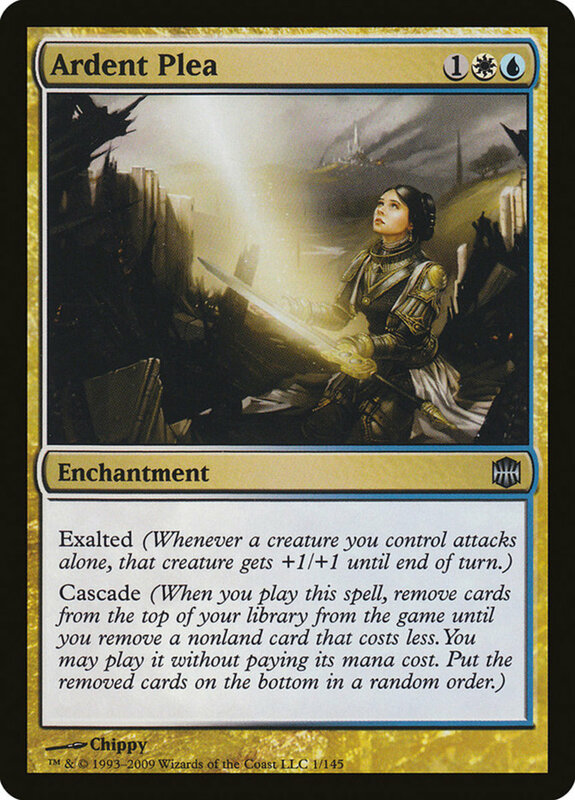 Even better, while you control creatures whose total power totals 10 or more, you can spend a green mana and tap Mosswort to play your exiled card without paying its price! 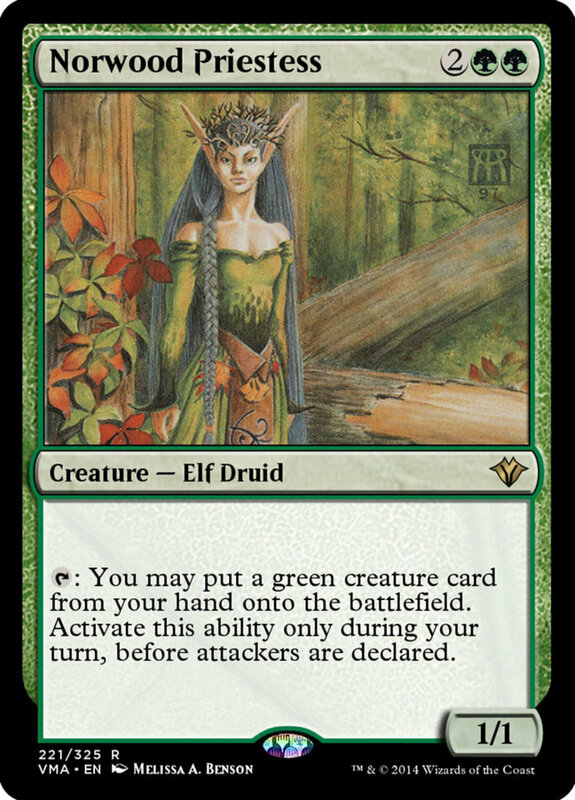 This activates high-cost cards of any type, and considering green's prowess for big creatures and +1/+1 counters, it's usually not too challenging to meet Mosswort's condition. This powerful sorcery reveals the top eight cards of your deck, lets you place one onto the field for free, then moves the others to your graveyard. 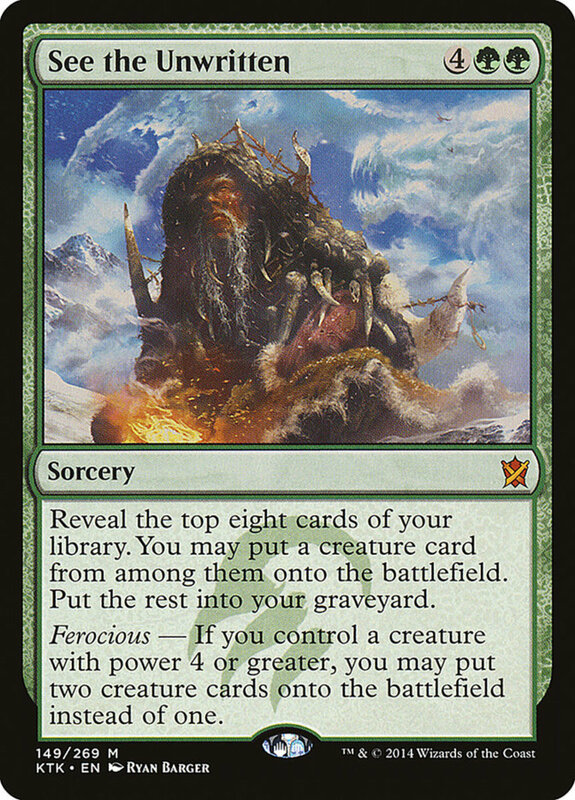 However, its ferocious trait lets you instead field two creatures if you control a unit with at least four power! The cool thing here is that, unlike many conditional cards, even the base effect is pretty impressive. Six mana isn't cheap, but you're both searching and fielding a unit, and eight cards is quite a stack to choose from. As icing on the cake, you're also filling your graveyard, perfect if you utilize revivals or flashback abilities. 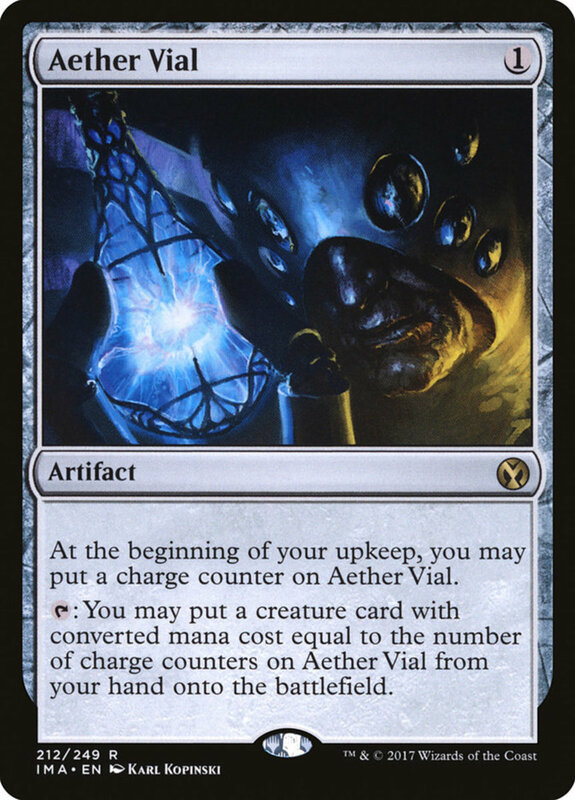 A single mana of any color, and Aether Vial is out. 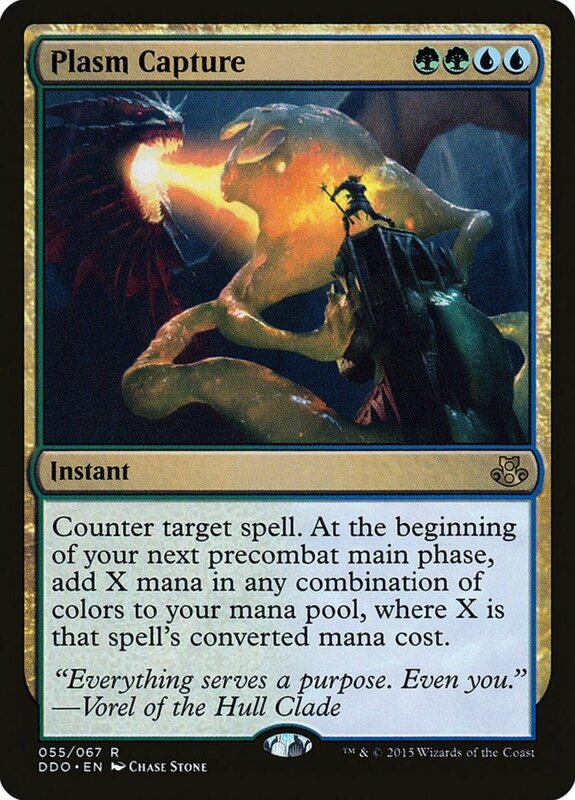 Then, during your upkeep step, you can (but don't have to) add a charge counter to it, and Aether can tap to place a creature with a CMC equal to its amassed charge counters onto the field. While this takes time to achieve higher values, it's still an awesome way to nab creatures of all sizes. If you proliferate your charge counters with cards like "Atraxa, Praetors' Voice", you can also get the higher values much faster. Just remember you can only tap to play monsters who exactly equal the charge counters, not ones that are cheaper, so be careful not to accidentally go too high. 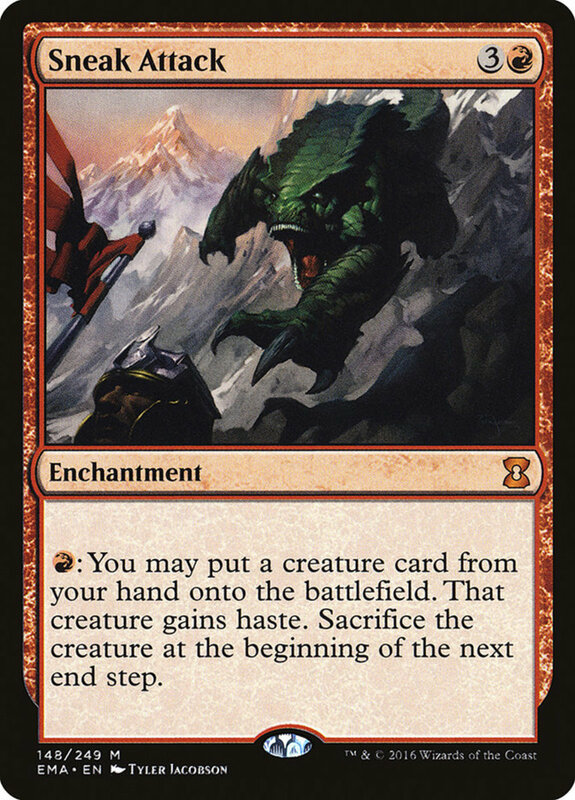 Defense of the Heart relies on your opponent having three creatures fielded, but that shouldn't take long to achieve, especially in EDH format (where they'll always have their commander available). Once the condition is met, play Heart and wait for your next upkeep step. At that time, you can sacrifice your enchantment to search and field up to two creatures from your deck! For a moderate mana cost and small conditional, you're both searching and playing not one but two units of any color and cost. 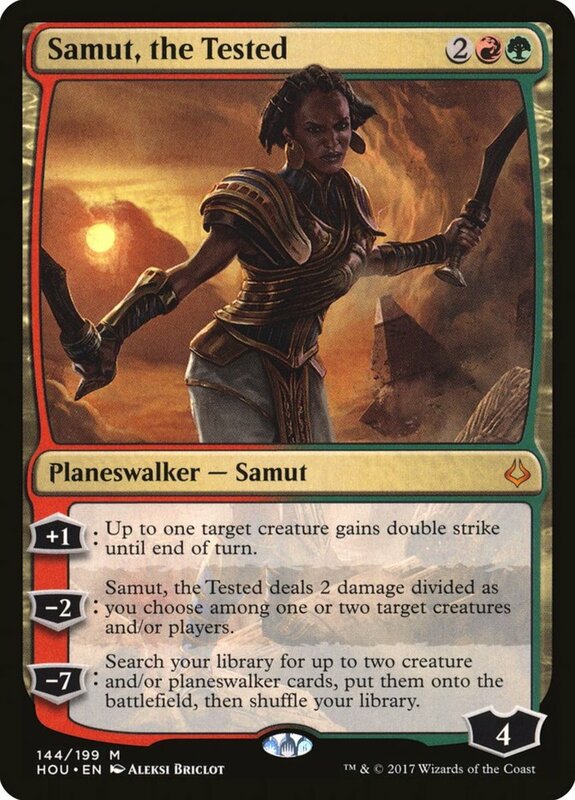 I enjoy using Heart to access giants like "Iona, Shield of Emeria" or "Kozilek, Butcher of Truth" long before I normally could, making it an easy pick for any of my green EDH decks. For its incredible powers and rarity, Heart often sells for a steep $50, but savvy shoppers may find steals that slash the price into more-affordable figures. Today we've examined many potent free-unit abilities, but Magic contains several routes to cast complimentary behemoths. For instance, the cascade ability lets you play cards from your deck, although it only works with cards with lower CMCs, so it's not quite as effective for your big guns. Graveyard revivals like "Reanimate" let you recycle defeated units, and many blue spells like "Corrupted Conscience" will simply steal opposing monsters; let your adversary do the work as you sit back and steal the fruits of their labor. We'll undoubtedly return to tackle more impressive free castings, but for now, as we eagerly await Wizards of the Coast's next expansion of creature-fielding spells, vote for your favorite card and I'll see you at our next MTG countdown!